Cornering on a mounatin bike. Being able to turn your bike well is a huge asset to your riding. If speed, flow, and riding to the best of your ability is a concern, then cornering well is a must. And if you’re new to riding – a beginner, novice, intermediate – control and safety in the turns is something that, if you’re not already concerned with . . . you will be soon. Am I going to break down all of cornering here, in the span of a few hundred words? No, of course, not! Not possible. But I will touch on some nuances of cornering and hopefully shed some light on many things that are overlooked when it comes to doing it right;. And, of course – no matter what level of rider you are – cornering well is about the human body working optimally in an athletic sense in harmony with the design of the bicycle. One is of 2-time, back to back current Enduro World Series Champ, Richie Rude. The others? Students of mine and myself. Point is, good cornering technique works at all levels. One bummer that I see in MTB coaching is that cornering technique is always exclusively about what happens in the corner (I haven’t seen any exceptions) . Bummer, because the most important part of cornering is what happens before the corner. If you don’t read the trail correctly you’re already dead in the water. If you don’t set up properly in terms of body position, line choice, momentum management, proper braking – all happening before the corner – it’s already game over. Notice the lean angle of the bike in the photos. Notice how the core of the body is still very upright and controlled. This provides a balanced and stable platform to ensure effective movements of the rider’s limbs and, thus, effective adjustments, corrections, and manipulations of the bike. Also, the bike will turn when you lean it over. We want to let that happen; let the bike do the work! 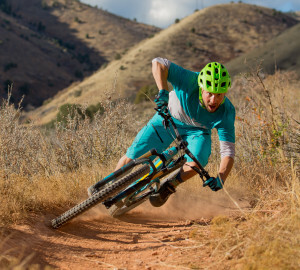 This means the rider can remain very much on top of the bike so that the weight and force of the rider pushes through the bike and stays much more perpendicular into the trail’s surface than if the rider leans the body at the same angle as the bike (as most riders do for various reasons). When we lean the body with the bike in a flat corner, the lower that angle gets, the more the forces of the rider are horizontal to the trail’s surface. This will eventually force the bike to slide out. We’ve all probably been there! Again, none of the good stuff above is possible if you screw it up before the corner. 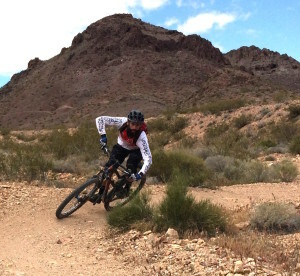 If you’ve been riding for a bit, you’re probably aware of the “attack position”, or the body position a rider should obtain while descending in tough terrain. This is the position the rider will need to be in approaching a corner (if the corner is at all fast or difficult). Assuming one understands the how’s and why’s of this position (which most riders don’t) and can obtain it while coasting down the trail or in the parking lot, then the question is how do we maintain that position as the bike decelerates hard under braking? 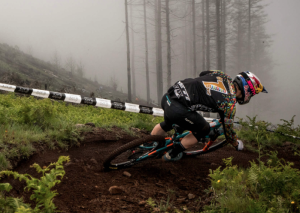 Or, maybe, gets loose and slides around when it loses traction because of braking forces and rough, loose terrain; bounces violently through braking bumps, root sections, and rock drops; all while trying to slow down for the turn? What should happen with the pedals? In the corner: Weight that outside pedal? No, not really. It’s actually about keeping the weight on the bottom bracket and centered on the bike as much as possible. I want riders to focus on moving the inside leg out of the way to get lean angle on the bike – not weighting the outside pedal. This difference of focus provides an emphasis on being centered on the bike and riding the bike through the bottom bracket. This is extremely important for control. This emphasis doesn’t happen when a rider focuses on weighting the outside pedal. Focusing on weighting the outside pedal can also create a lot of bad habits. We go over these in the camps. While my pedals will often go to 12 and 6 in relation to the bike, sometimes they are still level in relation to the ground and to my “line of force.” That means sometimes they’re 12 and 6 sometimes 10 and 4 . . . or anywhere in-between. Again, I want students to focus on keeping their weight centered on the bike, through the bottom bracket, and their pedals end up wherever they end up as a result of how much lean angle the bike gets. Drop the outside pedal, though, right? Well, sometimes. It depends on the trail’s surface. 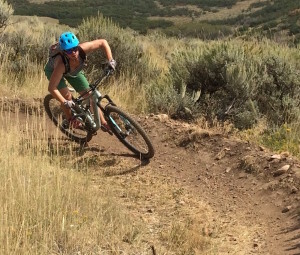 In a berm, bank, or rut – in theory – the bike is still perpendicular to the trail’s surface, thus, bike lean angle away from the body isn’t really necessary. In this case, we often can keep our feet level and lean the body with the bike. However, we simple can’t lean the bike over very far before it will hit our inside leg. So we have to move the leg – and rotate our pedals – out of the way. See above. Weight back? Weight Forward? Weight centered! Weight the bars in the corner so that the front wheel will get traction? Nope. I don’t care how many 23 year old – and often super fast – pros tell you to do this (It’s kind of a cool thing to say you ride the bike very aggressively over the front of the bike like a motocross rider. One big difference: a motocross bike has a motor so it will accelerate back under the rider. It often has to be ridden over the front end to accommodate that acceleration. MTB’s don’t have motors. Therefore, with very rare exception, they don’t accelerate back under the rider.) With very rare exception this is terrible technique and a terrible habit to get into. Also, there’s a huge difference in pushing down with the arms on the front of the bike, perhaps steering to get traction . . . and weighting the front of the bike. This has to do with how your body works in an athletic sense and is crucial to all areas of riding, I prove why in my camps (Go to 2:32 of this video). If I do end up weighting the front of the bike it’s almost always a result of overcompensating because my weight was initially too far back, the front wheel was in danger of drifting and now I’m doing damage control. Not fast, definitely sketchy! Keeping that outside elbow up is mega-important for so many reasons it isn’t even funny. Lead with the hips? It doesn’t really work that way. 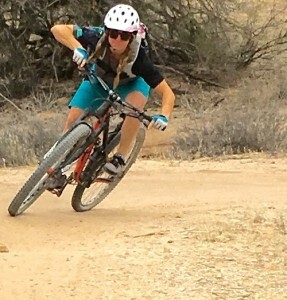 Obviously, there is a ton going on with properly cornering on a mountain bike. We address it thoroughly in the camps, spending a couple hours exclusively on cornering and touching on different examples through the duration of the camp. We relate descending body position and weight placement in a straight line to how this will directly affect our approach to cornering technique. Proper vision techniques are huge in cornering correctly. If you’re still reading this, you’re interested. If you’re already fast, then you know that every little thing counts, and from reading this, you’ve probably deduced that there is still a lot you can learn. 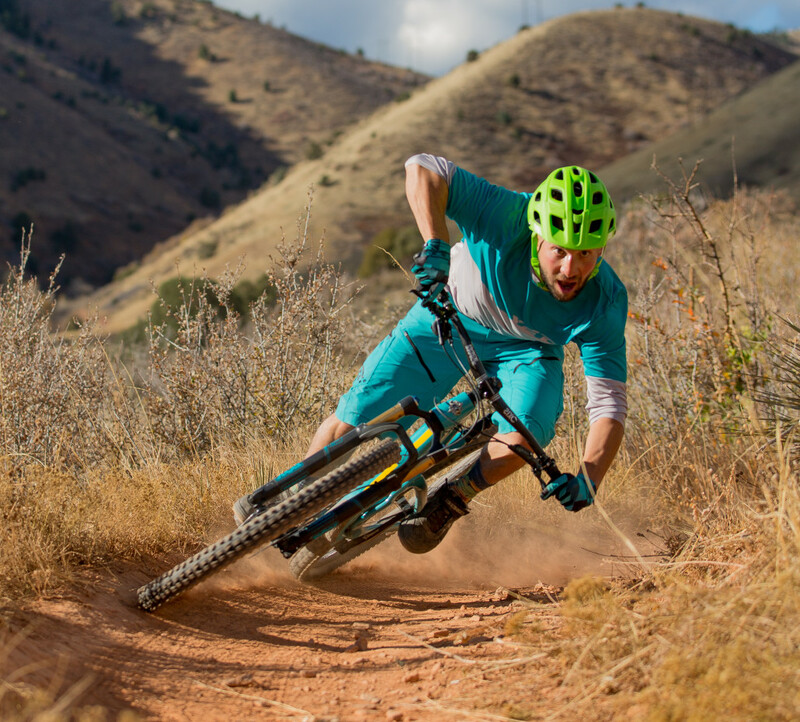 If you’re beginner, intermediate, novice, I promise, I can help you turn better, help keep that front end from washing out, and not only help keep you off the ground, but get you around the trail with more control, safety, efficiency, and – yes – speed! GREAT advice Andy. Question, why is it so easy to recert back to old bad form in corners like leaning with the bike, outside pedal at 6 o’clock etc. are there any drills you suggest for making good form a habit? Practice! Practice! Practice! Repetition . . . There’s so much happening with cornering that developing muscle memory and making the various movements automatic are really the only way we can ensure getting it right and replicating corner after corner — with good form — on the trail. I am doing many things different than I was when I was working with BR, a few new tricks, so definitely keep check out DirtSmart, the blogs, videos, etc. plenty more on the way!